This year summer single is named “Ahhahha! ~Chouzetsu Bakushou Ondo~” The PV was premiered on July, 26th and the single was released on August, 13th. I should get the photos set in a long time ago. However my bank who issues the card canceled the payment because the payee didn’t clear my transaction within the time. So CROWD didn’t send the photos set to me. Luckily WESYM who is in charge of CROWD system had still kept mine and help me to solve this problem. Finally I got my hands on it. 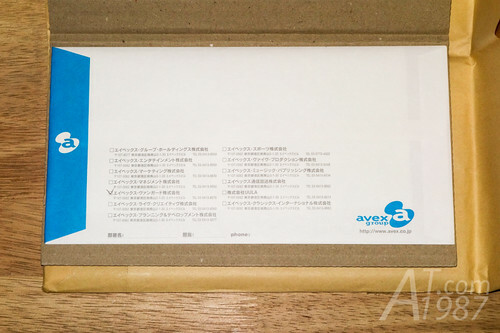 There is the letter from avex vanguard who is iDOL Street production company inside the package. 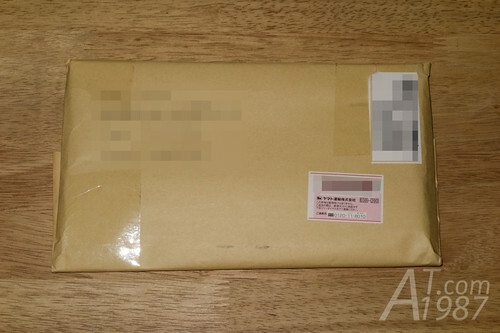 The thank you letter and photos set are inside the envelope. 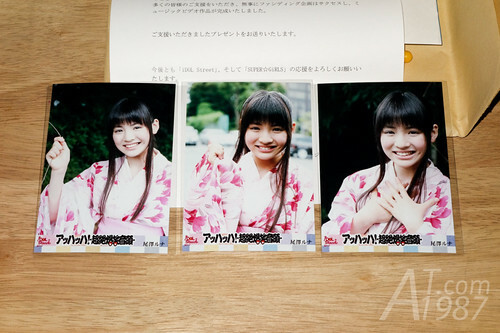 The photos set contains 3 on set photos of the chosen idol. You can choose all member of iDOL Street who took part in this PV except Cheeky Parade and Sapporo Snow ♥ Loveits. I chose NAGOYA Chubu’s Ozawa Runa who is well known from Tokyo Bandwagon drama. She is in the same yukata she wore in the PV. I think it’s very a hard choices to choose since I also like Kinjou Narumi and Katou Rihona from TOKYO TORiTSU but finally I chose Runachu. I am also regret that Rihona graduated from her group so I don’t have any chance to get her photos in the future. 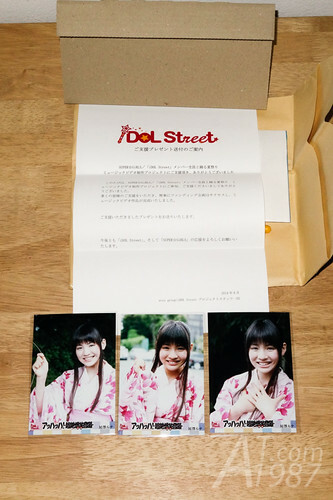 Although you have to wait for this kind of project from iDOL Street to support. You can support them now buying their goods from CDJapan.